Oney and Cadence are on stage, each feeling the presence of the other. Oney hopes her decision to escape and leave her family will allow her children and grandchildren to live in freedom. Cadence feels the connection to Oney, yearns to express her appreciation for the sacrifice she is about to make. The opening cue begins with an African Balafon and djembe, to which are added the sounds of the anvil, chains and bell. The fife and drum corps, signifying the power of government and the subjugation of the slaves, advances; intent on stamping out the notion of emancipation. 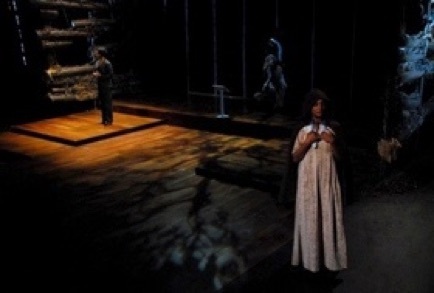 Thomas Gibbons’ A House with No Walls is a drama mingling current issues of racism and equality with the birth of the country and the duplicity inherent in the words and deeds of the founding fathers. A local civil rights activist becomes aware that the soon to open “Museum of Liberty” in Philadelphia sits on the site of George Washington’s slave quarters. 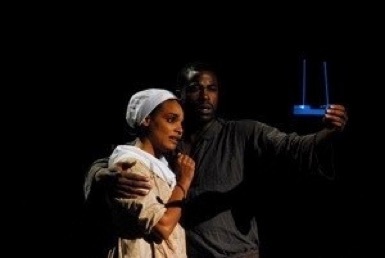 The play moves back and forth in time from the present to the story of Oney Judge, one of Washington’s slaves who is being urged to escape to freedom on the day Washington is leaving office to return to Mount Vernon. 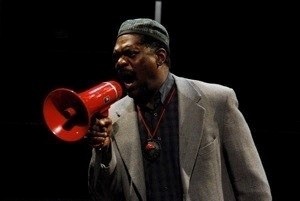 At the beginning of the play, Salif, the activist, hammers in surveyer’s stakes and cordons off the site of the slave house. This visual image of staking out the area in dispute led to an aural image of hammer on metal which was woven through the design. As Salif hammers each stake into the ground, a dim, distant sound of a hammer on anvil sounds, attempting to break the chains of slavery and injustice. Other aural images include the Liberty bell (signaling both the promise of equality in America and the cracked, broken promises of it’s leaders) and chains – sampled and played as a percussion instrument, along with the traditional African instruments kora, djembe, balofan and others. Leading the fight against Salif is Cadence Lane, a black female college professor and writer. She has become the darling of Republicans for her latest book accusing black activists of pandering and keeping African Americans in a perpetual state of victim-hood. 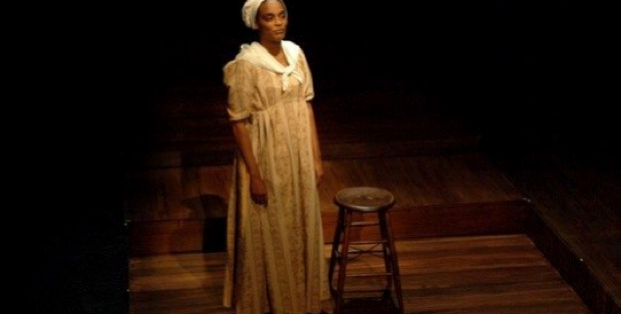 Her earlier work was studying the life of Oney Judge, (in period costume, who remains onstage throughout the play) and at times Cadence and Oney feel each other’s presence across the centuries. The sacrifice Oney made to leave her family behind and run to freedom resulted, in a way, to Cadence having the opportunities she’s had to become successful and influential. 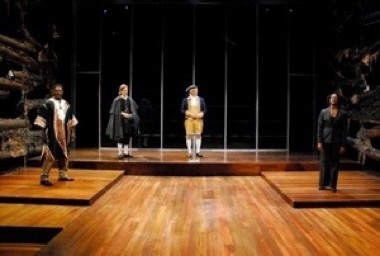 The end of the play conflates Washington’s farewell in 1796 with the museum opening, including a present-day Washington impersonator in a bit of comic relief. Throughout the overlapping time periods in the last scene, a fife and drum corps play offstage for both events in the past and present, closely tying the events of the past to the conflicts of the present.